Some of the most satisfying films play as if they started as short stories, telling simple, self-contained tales that capture the viewer with acting and visuals the way good prose does with words. That's the feeling evoked by Get Low, Aaron Schneider's impressive feature directing debut that stars Robert Duvall in another superb performance that begins his sixth decade of superb film performances. Get Low opens with a shot of a large house engulfed in flames while an unindentified figures flees the blaze. Usually, I'm good at remembering prologues such as this so that they stay in the back of my mind until I see (or figure out) how they play out later in the film. In this case, the rest of Get Low, written by Chris Provenzano and C. Gaby Mitchell from a story by Provenzano and Scott Seeke, so captivated me that I forgot about the opening until the incident comes up again. This may be Schneider's first feature, but he already has an Oscar to his credit, having won the 2003 Academy Award for live action short for Two Soldiers. Prior to that, Schneider worked as a cinematographer on the film Kiss the Girls and many TV shows such as Murder One , which won him two awards from the American Society of Cinematographers and an Emmy nomination. I imagine this background nurtured the 1930s-era Get Low's gorgeous, burnished look by d.p. David Boyd. Duvall plays Felix Bush, a small town's aging, eccentric recluse with long, unkempt gray hair covering both his head and face, who gets a visit from a minister, Rev. Gus Horton (Gerald McRaney), informing him that an old acquaintance has died. The man's passing puts an idea in Bush's head so he ventures back to Rev. 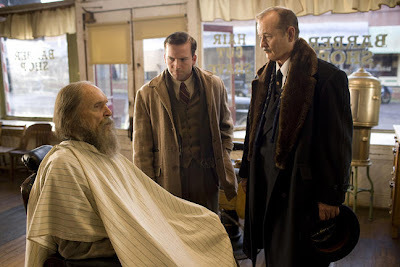 Horton, telling him that it's time for Bush to "get low" and he wants the reverend to plan a funeral for him — a funeral he plans to attend while he's alive. The minister declines, thinking it an odd idea he wants no part of, but a man named Buddy (Lucas Black, the young boy in Sling Blade) happens to be in the church with his wife and baby. He works at the town's struggling funeral home owned by Frank Quinn (Bill Murray). Frank can't understand how a business that should survive every economic swing could be in trouble. People seem to be dying everywhere else, but they are defiantly living there. That's when Buddy tells him he might be able to bring him some business. Buddy and Frank drive out to Bush's place, knowing full well he likes to take shots at trespassers, and Frank sends Buddy to the door (promising commission) and Felix soon explains his plans for a funeral party where everyone in the neighboring counties come to speak about him. Since he's generally disliked, he adds the idea of a raffle for his house and land at $5 a ticket. Frank gleefully embraces the plan as the way of putting his business back in the black. During a visit to town, Felix runs into a woman he used to date, Mattie Darrow (Sissy Spacek), who almost doesn't recognize him with beneath all that hair. Later, after he's gone to a barber and been groomed, Mattie stops by in one of the film's most beautiful scenes. Lit entirely by the flames from a fireplace, the talk between Felix and Mattie in his dark farmhouse not only provides great writing but displays images pleasurable to gaze upon. Unfortunately, the talk gets cut short when Mattie spots a photo of her late sister and surmises that Felix was involved with her while the woman was married and that's why he stopped courting Mattie. It's the first clue we get that there might be method to Felix's madness. As he says, he's kept himself in a prison of his own making for 40 years and he needs to purge himself of the secret he's held for all those decades and that's what he wants to do at his funeral for himself. When he finally does, Duvall's delivery will break your heart. He may have just turned 80, but Duvall has been one of our finest film actors for a long time and he still controls the powers of his gift and uses them to fine effect, knowing how to modulate them for comic or dramatic effect. The supporting cast all do well, especially Spacek, but they really appear just to serve Duvall and none fail. Murray gets most of the humorous parts, though he's tossed a serious moment here and there. It's impressive to see how Black has grown physically and as an actor now that he's an adult. There's also a fine turn by Bill Cobbs, who always adds a nice touch to just about anything in which he appears. With Get Low, you get an almost perfect package: great acting, great direction and great writing all in a technically fantastic film with glowing photography and intricately detailed production design. It really should have been remembered more in year-end awards across the board. Duvall tops that list of omissions. Sure, he has won one Oscar for Tender Mercies and been nominated five other times (and he should have won a second for The Apostle nomination), but he deserved that seventh nomination this year. I've seen all the nominated actors except for Javier Bardem in Biutiful, but Duvall's performance in Get Low clearly bests the other four nominees for best actor (and I think those four gave great performances as well — that's how good Duvall is).